The idea of downsizing is a wonderful thing, but it’s not easy! I mean, where does one begin? How many things do we attach meaning to due to our memories associated with an item? Even though in many cases these things are rarely used or serve any true purpose? Or how many things do we have lying around just because we are too lazy to get rid of them because when we do face them we are reminded of those memories? At one point in my life I realised I have way too many things and most of it really not worth anything financially, but rather, emotionally. I think the emotional attachment to our belongings is the hardest thing to cope with. On my list of “1001 Things to do” the getting rid of stuff is on the top of the list (this list isn’t an actual paper list, but rather an endless rambling of screeching voices in my head). Though it seems when I start to address it I find myself overwhelmed and then I shut down and stop. One thought on my mind I have had on and off for some time is the china. Yes, the dinnerware that is used on holidays and special occasions. My mother gave me her set that she had from marriage sometime ago. It’s not expensive and not necessarily the pattern I would choose. However, it has a family history and at the time I had no money for my own pattern. I was also given her silver-plated cutlery. I like shiny things so I was quite happy! An interesting thing about my mother set is that it was never completed. Apparently she had a falling out with her mother-in-law, my grandmother, who was purchasing pieces for her. So the cup and saucer you see is something my mother purchased because it has the same shape as the real cup and saucer. There are other pieces of the set which aren’t in the picture. Families can be so strange sometimes. 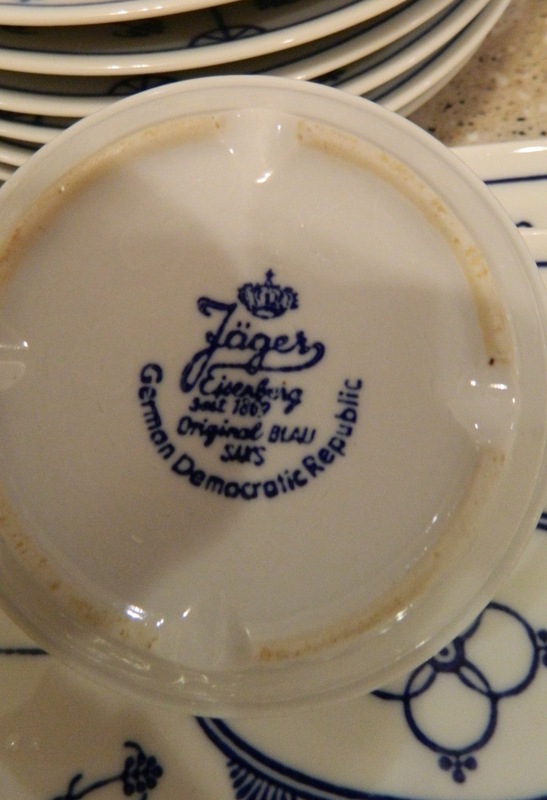 I also need to mention that once I accepted her china set I then ended up with my grandmother’s East German dessert set, a Norwegian dessert set and my aunt’s pine tree motif dessert set. How did this happen? I said, yes… that’s how it happened! I couldn’t say no because these things have been in the family for some time. Trapped… Ugh! Really, what I am going to do with all this? 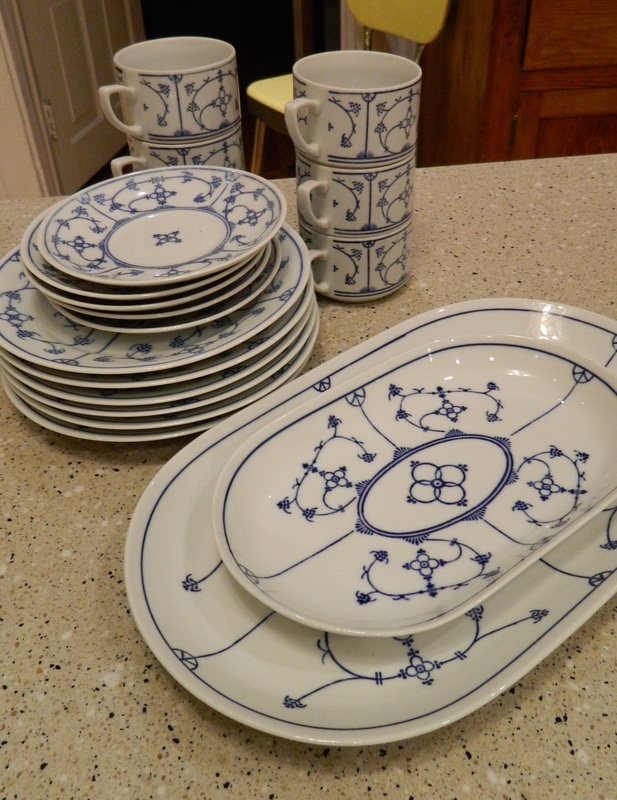 This set was something my grandmother picked up in East Germany many, many moons ago. Norwegian coffee is generally rather strong so you don’t need a large cup and these cups are tiny! 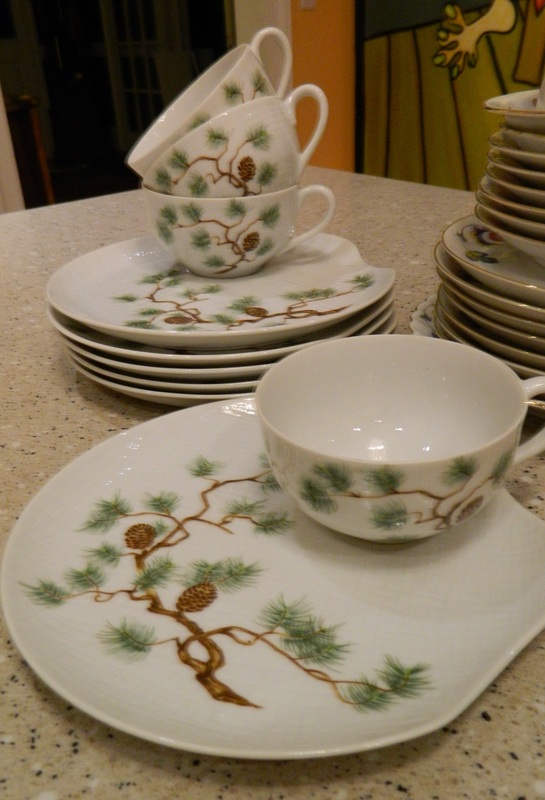 The pine tree motif dessert set fit your hand so well. The plate is shaped to rest in your hand nicely. There is a little indentation on the plate where your cup rests nicely. 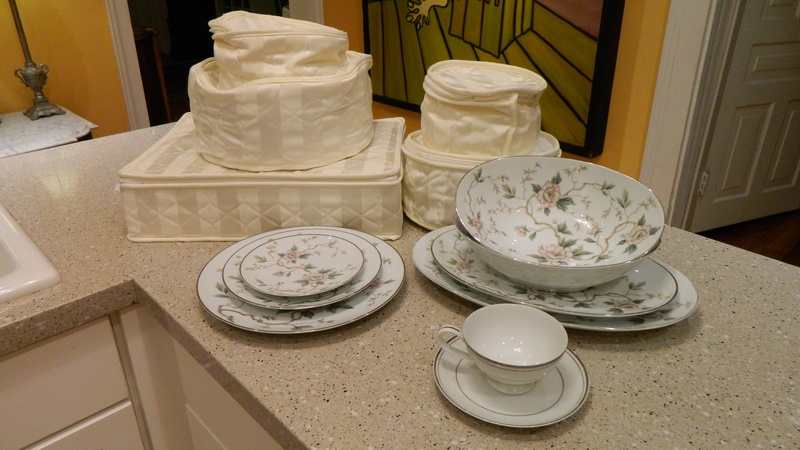 The reason I mention the china is because these are items we use occasionally and otherwise just sit in a cabinet. Ever since I left Savannah I have not had a dinner party in almost 7 years! I don’t expect I’ll have one here because all my friends are back home or have gone on to different places too. Why do I hold on to all these things? I suppose it’s the emotional attachment and a sense of duty. Currently, my every day dishes are starting to dwindle. I have several cracked and chipped plates and now a couple of cups have developed cracks and one sprung a leak the other day. I love this set, but unfortunately it is no longer available. Replacements (if you are unfamiliar with Replacements.com, I suggest you check them out) has some pieces, but not the salad plates and it doesn’t look like they will. 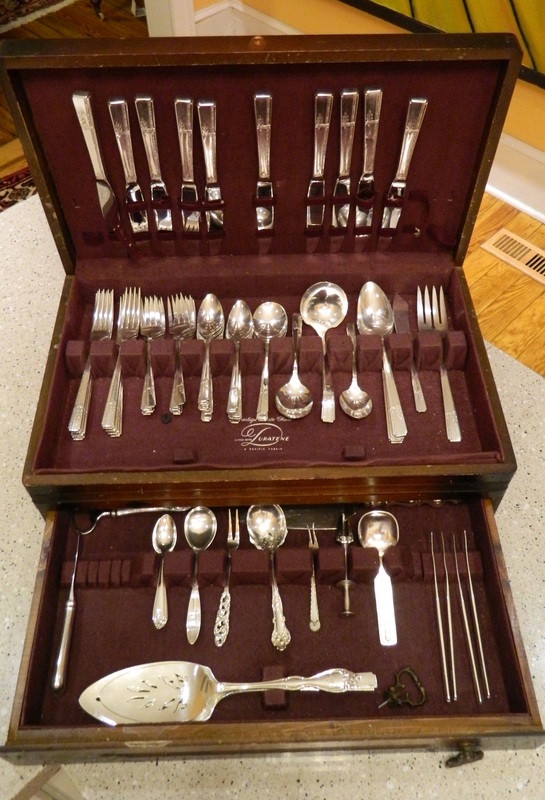 Mostly silver-plated with a few sterling pieces… glistening and begging for use! In light of things I have been thinking about using the china and silverplate for everyday use. One issue I need to get over is the traditional belief that these things are only of for special occasions. I will need to speak to my mother about it first. Ha! Another issue is the china is definitely more fragile and there will be accidents. However, Replacements.com does carry almost every piece needed. As for the silverplate, it can’t go in the dishwasher because I would like to maintain the patina within the design. So if I can get over these issues than I’ll be good to go. Using these things means they will have true purpose and not take up space. Another benefit is I am using what I have and won’t be spending money on more things such as dishes. 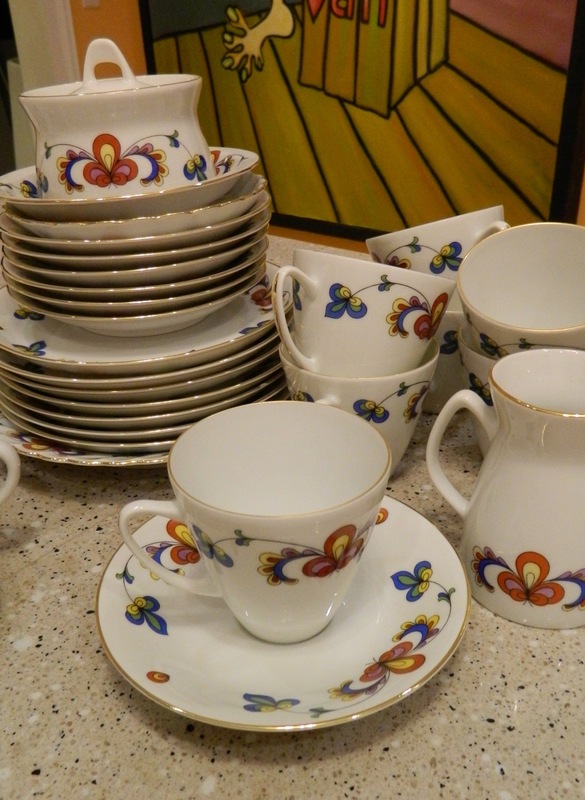 My mother recently told me I’ll probably inherit my grandmother’s china and sterling, which is what she now uses. I said to her I thought it was to go to my sister. My mum said she thought my sister wouldn’t want it or have use for it. My sister lives near Seattle and apparently people there are so terribly casual they use plasticware for everything. The story goes, when my sister first moved to Seattle and made new friends she had them over for a gathering. 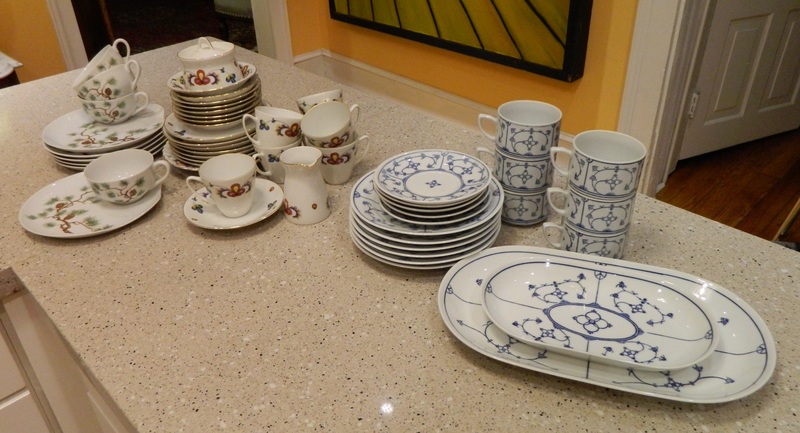 As many people do on the east coast, she used her china and silver and made everything nice. Apparently, some of her guests were offended and told her they thought she was showing off and putting on airs. I told my mum that it really must be the friends she keeps! My mother said apparently it’s a different world in Washington. I am not sure I will end up getting my grandmother’s china and sterling, but it would be nice. Especially if I use all this china and silverplate for my new everyday use. Hmm… it means more stuff. Allie, you are absolutely right. Downsizing is like therapy! I have a lot to work through, but it really needs to be taken in small steps. I think I have a good start and it sounds like you have managed to move on from the sense of duty to your grandmother and release these things to people who will appreciate them as much as she did. Thanks for stopping by!